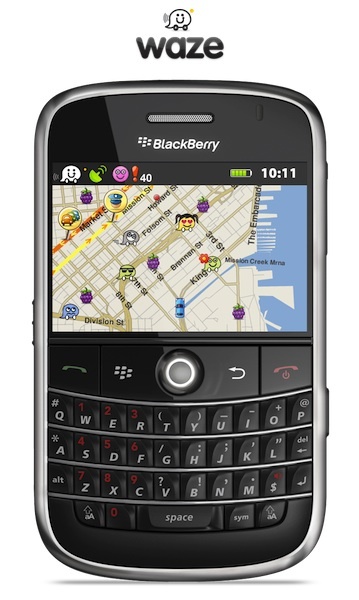 Waze, the well-known social GPS app currently available for the iPhone, Android, Windows Mobile and Symbian platforms, has announced they are coming to the BlackBerry beginning today. I have had the opportunity to test drive the beta for the last week, and as of this morning, the app is now available for download. Waze is a free mobile navigation app that allows drivers to build and use live maps, real-time traffic updates and turn-by-turn navigation to improve their daily commute. Waze also incorporates social elements that give drivers the ability to actively update one other on traffic, police traps, construction, speed cams and more. Since waze is 100% user-generated and routes may not be optimal in all areas from day one, waze learns quickly, so the more people who use waze, the better, it gets. They are even running a contest for those participating in the beta, offering up an iPad for the person who munches the most "road goodies" - small icons worth bonus points - from May 4th thru 14th. I have to tell you, even though this app is in an early beta phase, the attention to detail and work that has gone into it shine through already. It does have it's bugs, and is somewhat shaky on some functions, but the dev team at Waze has been fantastic with responding to feedback, and are looking for even more from the CrackBerry.com community. Give it a go, and very soon you'll find yourself taking a drive just for the opportunity to play with this little app, and taking detours from your normal route because you see a "cupcake" just one street over.